Hey friends... 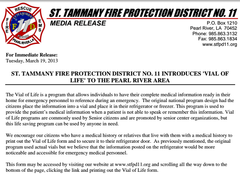 Wanted to remind everyone of the 'Vial of Life' program that we rolled out through our department last year. In a nut shell, this program allows our residences to post urgent and important medical information on their refrigerator so that this valuable information is available to Emergency Medical Services personnel should we get called.. Often times we get called and the residence may not be able to recall valuable information or they may be unable to speak or answer questions. This program is useful for anyone who may have medical concerns that need to be known to Emergency Medical Services personnel. Thanks for your continued support. Stay safe and well!